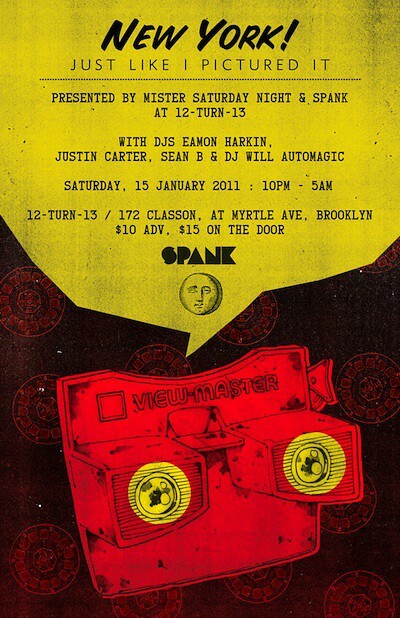 To ring in the new year we’re partnering up with our friends Sean B and Will Automagic from Spank to bring you New York Just Like I Pictured It – a party combing the philosophies and followers of two of New York’s most beloved parties at the always wonderful 12-turn-13 loft space. Consider the top drawer music selection, superior sound production and the passionate and open-minded crowd of Mister Saturday Night alongside the flamboyance, swagger and sense of adventure of the Spank parties and you’ve got the type of unique and interesting concoction which only a city like New York can bring. You said your new years resolution was to try new things. Well here’s your chance! This one’s is this Saturday, January 15th. Not too long away. Details on the flyer, advanced tickets here. Save that date!